What are the age requirements for BFE Rock Club? You must be 21+ and have valid ID to enter BFE Rock Club. Certain shows and events are open to 18+ or All Ages (with Parent/Guardian). Check the Event links on our Calendar or contact us if you have questions regarding a particular show. Where is BFE Rock Club located? We are located in Northwest Houston, just minutes north of Hwy 290, near the corner of Jones Rd and FM 1960. Is smoking permitted inside BFE? Yes, smoking is permitted inside the club. Our normal business hours are 6:00 pm - 2:00 am on Wednesdays and Thursdays, and 12:00 pm - 2:00 am on Fridays and Saturdays. We are typically closed Sunday-Tuesday, unless a special event or show is scheduled. Is there seating inside the club, or is it standing room only? Yes, we have plenty of seating throughout the club, including an elevated VIP section, booths, etc. If you would like to reserve a table, booth, or the entire VIP section, contact us. Is photography or filming allowed in the venue? Unless otherwise stated, photography and video is allowed in BFE Rock Club. Under certain circumstances, specifically events involving National Touring Acts, permission may have to be obtained from Artist Management, the Event Promoter, etc. If you have any questions about whether or not photos and/or video will be allowed during a particular show, contact us. Who are some of the famous acts that have played at BFE? Drowning Pool, Saliva, Otep, Puddle of Mudd, Saving Abel, Framing Hanley, Sepultura, Doyle (of The Misfits), Lita Ford, Autograph, Tim "Ripper" Owens, Flyleaf, Lacey Sturm, The Velcro Pygmies, LA Guns, Dilana, Barb Wire Dolls, Adema, Smile Empty Soul, Alien Ant Farm, Deadhorse, Every Mother's Nightmare, D.A.D. (Disneyland After Dark), and many more! 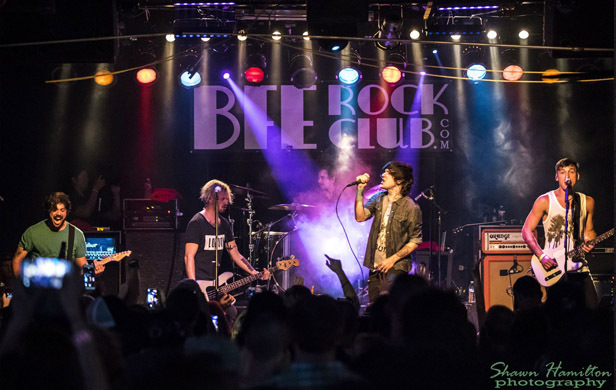 Is BFE Rock Club available for filming productions? "The Pickaxe Murders Part III - The Final Chapter"
How do I book my band at BFE Rock Club? Copyright 2016 BFE Rock Club. All rights reserved.